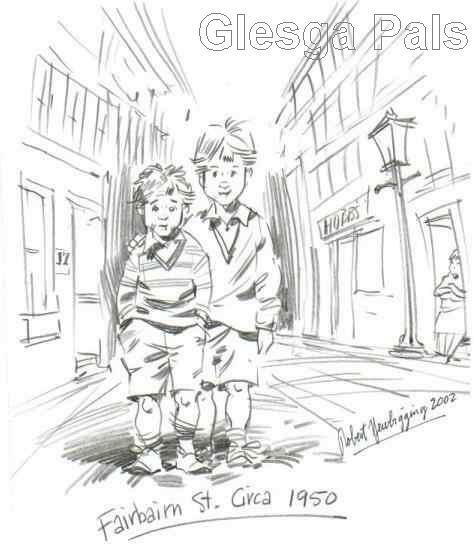 Fairbairn Street sketch by Robert Newbigging. Robert was brought up in Fairbairn Street, Bridgeton, now lives in Canada. Aug.2007 ......I've been in Canada since 1966 and never considered the States at all although I had relatives there. Canada is very different although many people see it as the same massive continent. I lived in Montreal for 10 years and had a magic time. It's a wonderful city but politics and business forced us back to the Toronto area. When my wife and I arrived in.1966 we also had two kids with us. Two boys. A one year old and a two and a half year old. I had no job but kept my fingers crossed. It all worked out eventually but was hard for a few years. My parents are both dead now and I'm an only child the same with my wife Ellenor who came from Rutherglen. We have three sons and four grandweans anyway........We have some very close friends in Glasgow so we will probably be back one day soon. I'll give you a call for sure. Regards, Robert.